NOVEMBER 19, 2014 -- "I've never reopened a nuclear power plant," thought NOAA's Ed Levine. Despite that, Levine knew it was his job to get the right information to the people who ultimately would make that decision. This was his role as a NOAA Scientific Support Coordinator during oil spills. However, most major oil spills do not affect nuclear power plants. This wintry day in 2004 was an exception. Forty miles north of the Salem Nuclear Generating Station in New Jersey, an oil tanker called the Athos I had struck an object hidden beneath the Delaware River. As it was preparing to dock at the CITGO refinery near Philadelphia on November 26, the ship began tilting to one side, the engine shut down, and oil started gushing out. "Not your typical oil spill," later reflected Jonathan Sarubbi, who served as U.S. Coast Guard Captain of the Port and led the federal response during this incident. Not only did no one immediately know what the ship had hit—or where that object was located in the river channel—but the Athos, now sitting too low in the water to reach the dock, was stuck where it was. And it was still leaking its cargo of heavy Venezuelan crude oil. Capt. Sarubbi ordered vessel traffic through this busy East Coast shipping channel to stop until the object the Athos hit could be found. Little did Capt. Sarubbi, Levine, and the other responders know that even more challenges would be in store beneath the water and down the river. Most oils, most of the time, float on the surface of water. This was precisely what responders expected the oil coming out of the Athos to do. But within a couple days of the spill, they realized that was not the case. This oil was a little on the heavier side. As it shot out of the ship's punctured bottom, some of the oil mixed with sediment from the river bottom. It didn’t have far to go; thanks to an extremely low tide pulling the river out to sea, the Athos was passing a mere 18 inches above the bottom of the river when it sprung a leak. Now mixed with sediment, some of the spilled oil became as dense as or denser than water. Instead of rising to the river surface, it sank to the bottom or drifted in the water column. 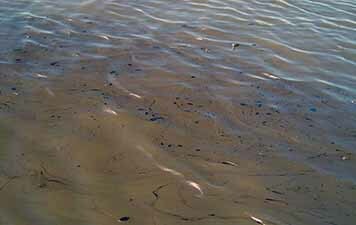 Even some of the oil that floated became mixed with sediment along the shoreline, later sinking below the surface. For the oil suspended in the water, the turbulence of the Delaware River kept it moving with the currents increasingly toward the Salem nuclear plant, perched on the river's edge. NOAA's oil spill trajectory model GNOME forecasts the spread of oil by assuming the oil is floating on the water's surface. Normally, our oceanographers can verify how well the forecasts are doing by calibrating the model against twice-a-day aerial surveys of the oil’s movement. The trouble with oil that does not float is that it is harder to see, especially in the murky waters of the Delaware River. Responders were forced to improvise. To track oil underwater, they created new sampling methods, one of which involved dropping weighted ropes into the water column at various points along the river. The ropes were lined with what looked like cheerleader pom-poms made of oil-attracting plastic strips that would pick up oil as it passed by. Nuclear plants like the Salem facility rely on a steady flow of freshwater to cool their reactors. A thin layer of floating oil was nearing the plant by December 1, 2004, with predictions that the heavier, submerged oil would not be far behind. By December 3, small, sticky bits of oil began showing up in the screens on the plant's cooling water intakes. To keep them from becoming clogged, the plant decided to shut down its two nuclear reactors the next day. 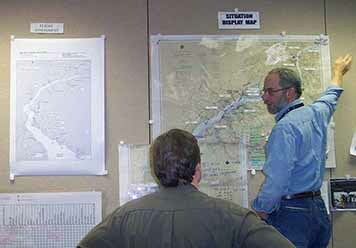 That was when NOAA's Ed Levine was tasked with figuring out when the significant threats due to the oil had passed. 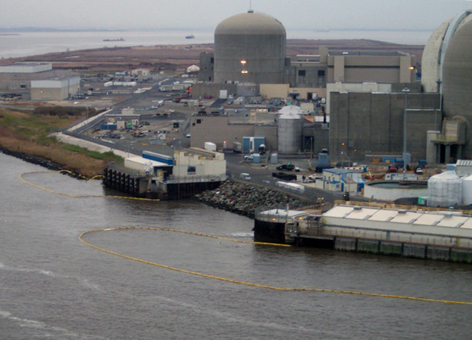 Eleven days later, the Salem nuclear plant operators, the State of New Jersey, and the Nuclear Regulatory Commission allowed the plant to restart. A combination of our modeling and new sampling methods for detecting underwater oil had shown a clear and significant drop in the amount of oil around the plant. Closing this major electric generating facility cost $33.1 million out of more than $162 million in claims paid to parties affected by the Athos spill. But through our innovative modeling and sampling, we were able to reduce the time the plant was offline, minimizing the disruption to the power grid and reducing the economic loss. Levine recalled this as an "eye-opening" experience, one yielding a number of lessons for working with nuclear power plants should an oil spill threaten one in the future. To learn more about the Athos oil spill, from response to restoration, visit response.restoration.noaa.gov/athos. A special thanks to NOAA's Ed Levine and Chris Barker, former U.S. Coast Guard Captain Jonathan Sarubbi, and Henry Font, Donna Hellberg, and Thomas Morrison of the Coast Guard National Pollution Funds Center for sharing information and data which contributed to this post.